Having a family pet can be great fun and it can help reinforce positive behaviors as well as incite feelings of unconditional love. Pets can very much be a part of the family, and many families may already have a pet of some kind when a child is born. When buying or adopting a pet, there are so many details to be worked out which is why this decision cannot be done on a whim. For example knowing how it will be taken care of and whose responsibility that will be, not to mention whether you can afford food, accommodations and medical care for them as well. Here are some questions that you will want to consider before going ahead and choosing a family pet. Who will be taking care of the pet? Make sure that you have the time and resources to take care of a pet. Pets need attention and care as much as a child and will need much of your time. Keep in mind that even If the responsibility falls on the children, parents will wind up doing a whole lot more depending on the age of the children. What is the appropriate age for my child to get a pet? It’s important to consider the age of your child before getting a pet. If you are getting a pet for your child specifically, it is important that they are old enough to take on the responsibilities of doing so, and it is generally recommended that kids be of middle school age (around 12-14). Grade school kids may be able to help out, but it will most likely be more of a joint family effort. Getting pets when your child, or children, are younger can be tricky, but it can be done. 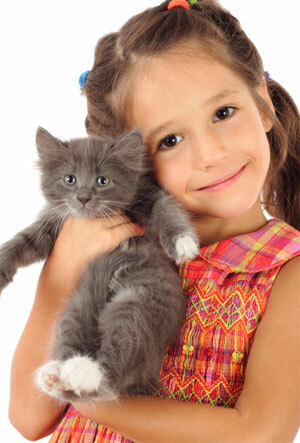 If you are new to pet ownership, it may be best to wait until your children are older. When children are small, you need to be aware of the potential dangers that are present – from the pet as well as your child. Certain pets may react towards children differently than others it all depends on personality. Nevertheless, it is important that children and pets are always supervised, especially since they have the power to harm the other, even inadvertently. Some parents already have a pet in mind, in which case you should still do some research and find out if there are any breeds you should consider over others or if there are any potential risks that you may not be aware of. Additionally, it helps to look into scheduling or arranging meetings at shelters or wherever you are looking to get your pet from so that your child, as well as the whole family, can become acquainted first and see if you’ll all get along. Aside from that, there are many pets to choose from, of course, and making a decision can be quite daunting. ● Dog. Dogs seem like the quintessential pet for the All American family. Dogs can help children develop strong bonds, especially since the animal-human relationship can be pretty intense when it comes to canines. ● Cat. Cats are great for cuddling, but they may not always be as social as dogs, so cats might make better pets for children who may not mind their occasional aloofness. Cats can often differ in personality, some acting very quiet and independent whereas others may have personalities that are just as outgoing and energetic as a dog’s. ● Fish. Fish are a great way to introduce the idea of pet-ownership to children who have never had pets before. It is also a good way to help teach responsibility to younger children, before getting a dog or another pet that requires more hands-on care. ● Hamsters or gerbils. These pets are smaller and often confined to cages, but they still require more maintenance than many parents may anticipate. They are also smaller and require a gentle hand, so you will need to consider whether your child is ready to handle a pet of this kind and size. It is also important to keep in mind that these pets do not often live very long, not much more than a few years. Depending on your child’s interests, you might also consider pets such as birds, ferrets, lizards and so on, but again these pets generally require a very specific kind of care and attention. ur children will love and cherish forever, even long after they’re gone. For more parenting resources be sure to subscribe to our blog www.KDNovelties.com/blog.